BRAKE PADS fits NISSAN SUNNY Estate - 90>00 - FE16275. Part Number: PAD808 (Ref.Only). Manufacturer Apec Braking. 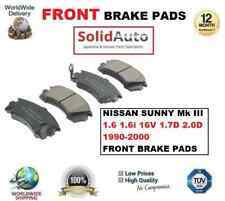 REAR BRAKE PADS FOR NISSAN SUNNY. Model: Sunny. Rear Brake Pads. Make: Nissan. Quantity Brake Pads set(full). NISSAN : 4106067R86. Brake Pad Set fits NISSAN SUNNY Box - 90>00 - ADN14245. DP4665R EBC Yellowstuff Front Brake Pads for NISSAN SUZUKI Silvia (S13) Sunny 180 SX Silvia Swift. Greenstuff Brake Pads. Choose from EBC plain non drilled rotors or sport rotors in two choices – wide aperture GD Sport Rotors series for cooler running or new super silent UltimaxUSR slotted rotor series.